Don’t live in Hampton Roads or only have a small problem? Remote computer repair services by PC Pros 2 Go is the answer you’ve been looking for. With the advances in software technology we can remote in to your computer, with your permission of course, and repair problems that are giving you a headache. We can fix a great number of computer problems with our service. We can also provide remote assistance to questions you might have on a piece of software. We’ve used remote computer repair to help numerous people from all over the country. A computer with a problem. A working active internet connection. The ability to download and run the remote software. Now remote service won’t work for everyone. A typically people will use this service for virus removal, however, some infections will prevent you from downloading anything. While others block your internet all together. So if your problematic computer can’t get to the internet then our remote service will not be able to help. In which case you’ll need regular computer repair and get a technician out to repair the problem. 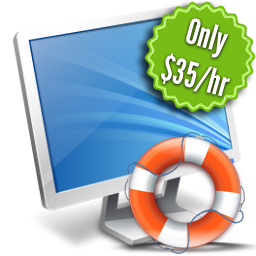 Our current rate for providing remote repair service is $35 per an hour. While we can do most things with out assistance, depending on what service needs done, we may need your assistance. This could unplugging and replugging in a printer, if we’re working on a printer issue. Of in the event we need you to reboot the machine into safe mode. If you’re a repeat customer, and you always have a question or something that needs to be done on your computer you can always leave the access turned on. Then all you have to do is let us know what’s going on and we’ll take care of it. We look forward to assisting you with your computer problems. If we provide you remote computer repair don’t forget to provide us some feedback about how your service went. We’d love to hear from you. 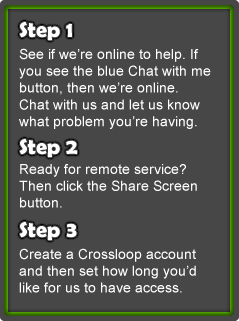 A feedback form will open up after our remote connection is finished.